Patrick John (P.J.) 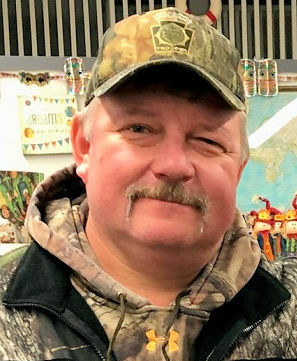 Brenot, 48, died unexpectedly at home on November 28, 2018. P.J. was born October 10, 1970 in Meadville a son of Patrick F. and Kyle L. Davis Brenot. He was a 1990 graduate of Meadville High School. On June 5, 2015, he married Melinda S. Emig, they were together for nearly nine years and she survives. He was a member of the Emmanuel Community Church. He was a member of the Local #210 Roofers Union for 28 years and more recently worked for the Mercer Spring and Wire. P.J. enjoyed hunting, fishing, ice fishing and was an avid Pittsburgh Steelers fan. He also loved spending time with his grandchildren. P.J. was a compassionate and loving husband, son, father, brother, and friend to all. In addition to his wife, Melinda, he is survived by his mother, Kyle Brenot of Meadville; a son, Michael Brenot (Sarah) of Cochranton; step-children, Brennan Lippert of Cochranton and Carleigh Lippert of Hartstown; a grandson, Adam Brenot; two step-grandchildren, Ezra and Lilly Lippert; two brothers, Kevin Brenot (Aine) and Thomas Brenot (Amanda) both of Meadville; a nephew Seth; and two nieces, Erin and Megan. He was preceded in death by his father, Patrick F. Brenot; mother-in-law, Charlotte (Charlottey) Emig; and two uncles, Edward Brenot and Michael Brenot. Calling hours will be Saturday, December 1st from 3-6 p.m. at the ROBERT W. WAID FUNERAL HOME, 581 Chestnut Street. The service will be Sunday, December 2nd at 3:00 p.m. at the Emmanuel Community Church, 30 N. Park Ave., Meadville with Rev. Tim Soloman officiating. Memorials can be made in his name to the Emmanuel Community Church. Memories and condolences can be made at waidfuneralhome.net.